Upgraded from version 1.514 to 1.515 and I get an unhandled exception. uninstalled version 1.515 and re installed version 1.514 and HSMAdvisor worked again. There might be something wrong with the installer or the program itself? If I say continue in the exception message it says loading but just sits there and does nothing. Could you try to install the 1.515 again and send me the detailed information (click on Details button) when the exception happens? Because i can not replicate the issue. Must have something to do with your particular configuration. I deleted the download of version 1.515 and re downloaded it. 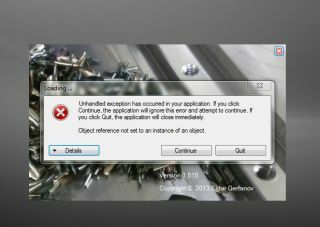 I then reloaded the 1.515 version and got the same unhandled exception. I cut and pasted the error message into a text file for you to see. As far as I know everything on my computer is up to date. Thank you for the great support of this product!! I'm getting the same error, just updated to the latest version. Guys, did you get my emails? I'll double check my contact info to see if it is still the same. My contact info is still the same. Documents\test" and try to run it? It should give the exact place where the error occurs. Then just send me the same extended error output. Would be a huge help form you. Edit: feedback received and file removed. downloaded the zip file above and ran it. Now i know where the issue is! I will release an update before Monday. Again thank you, everybody for swift reporting! Thanks for the support Eldar! Can you email me your tool library file? Tried version1.516 this morning with the same results. Unhandled exception so I the emailed you my database. hope it helps with the dignosis of the problem. I am looking it at right now. Thanks! EDIT: Thank you for help, guys. Thank to your feedback i finally pinned the issue!